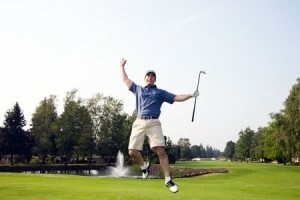 We all love to play golf but don’t you want to have a better golf game? I have cut my playing down quite a bit over the last few years and have made it a point not to pass a practice green. My body doesn’t allow me to hit as many golf balls as I did when I was younger but there is no excuse to not practice chipping and putting. Play at least two new courses in 2016. Playing your home course with your buddies is fine and can give you bragging rights. Venture out of your comfort zone to play more challenging tracks where you don’t know every break in the greens. This will give you a more accurate assessment of your short game. We all have a group of friends we play most of our golf with but try inviting a new face or two to join you. You can learn so much about people on a golf course and those four hours can allow you to find common interests and even help you in your job. Be kind and considerate to your playing partners. Everyone wants to shoot low scores but on days when things might not be going your way, encourage and congratulate your playing partners. Remember everyone is out there to enjoy themselves and relax. A few kind words can go along way to improving your mood and theirs. Make a plan to improve and stick to it. If you’re a 14 handicap and have always wanted to be a single digit, do something about it. Assess each aspect of your game from driving to putting and give yourself a realistic grade. Then make a plan on how you can lower your scores. Take a couple of golf lessons and ask your professional what drills and practice routines would be best for you. Make sure your clubs are right for you. Properly fit golf clubs can make a big difference in your game. length and lie angle are important but shaft, shaft flex and grip size can really make a difference in the direction the ball is flying. I played standard length and standard lie irons for a long time, but when I had my clubs extended and bent a couple degrees upright, I didn’t have to fight the ball going right. Get refit every couple of years by a PGA professional to make sure things haven’t changed. These are my ideas for 2016, what do you have planned to make your game even better? If you need help setting some goals, give me a call. Who doesn’t like to have success on the golf course, whether that’s making a par or birdie or just making one good putt? Whether you play competitively or just for fun, lowering your score is just as satisfying. 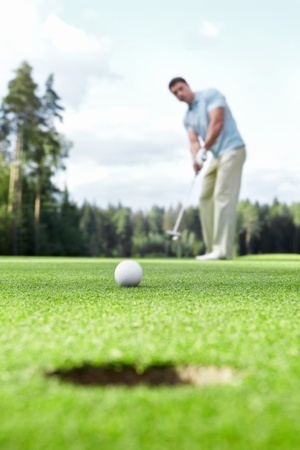 Working out the kinks in your swing on the golf course can lead to a tedious round of golf. Work with an instructor on the driving range to create repeatable mechanics. Nothing’s worse than not knowing where the ball might go when you hit it. Competition among friends can be fun, especially when you have a chance to win! No need to stand in front of a water hazard wondering what club to hit or whether the ball will go sideways. You can face that water hazard with confidence. You’ve tried everything and asked everyone about how to fix that slice. Now let a certified golf instructor tell you just how to fix it… and it’ll only take an hour. While good clubs are a great asset to the game, solid repeatable fundamentals are just, if not more, important. Invest in your swing first then complement it with some great clubs. Like any activity, to do it well one needs to learn and practice to become better. Just showing up never made anyone a better golfer. Invest a small amount of time for the greatest satisfaction. And the number one reason to take a golf lesson? 1. Because it is easier to do anything with a little help. You don’t have time to learn all the intricacies of putting, chipping, full swing and golf course management on your own. Self help videos and YouTube tutorials can’t give personal feedback. Like exercise, you really want to commit to it and get better but there are so many excuses not to and not enough time to research it yourself… It’s so much easier when you have someone to guide you. A professional who knows exactly how to fix the problem and can work with you one on one. No more excuses, schedule a lesson to start improving today!